After more than 11 years as a technology journalist with IDG Communications I began a new role as a senior analyst with Telsyte this month. Telsyte is a local ICT research firm based in Sydney – see Telsyte.com.au. My reason for the move relates to needing a change more than anything else. I must hold the record for the tenure of a cadet journalist and I think I owe it to myself to branch out a little. I certainly won’t rule out any return to journalism, but for now I’ll have to settle for the odd freelance job when it pops up and I’m still hoping to make LCA where there are always juicy stories waiting to be discovered. Thinking back over the thousands of articles I have written, the thing I will miss the most is helping to publicise small open source projects and community initiatives which may not have otherwise had a voice. But I already have some ideas on how I can still help make that happen (all under Creative Commons, of course). I’m also pleased to say my replacement for TechWorld, Rohan Pearce, shares much of the same software interests as me. And if you’re an aspiring IT journalist I highly recommend IDG as a place to begin your career. If you are an independent software developer or open source project contributor and need any advice on relating to the media do drop me a line and I’ll see what can be done. As for my new role I’m enjoying it a lot (I lasted longer than a week!) and we have a number of exciting projects in the works due for release later this year. Starting a new job with a new company has injected me with a feeling that’s difficult to describe. It’s like beginning your career all over again. Someone has already joked that I need to stay with the company for 20 years to double my old record :-). At Telsyte staff can bring their own notebooks and other devices and we have Ubuntu servers running Samba for file serving. 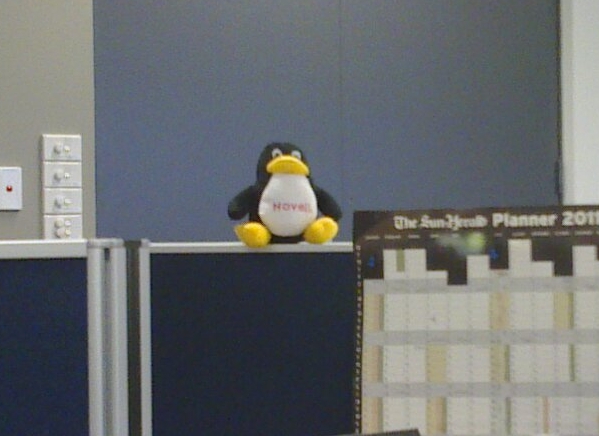 Incidentally, overlooking my seat from the desk directly opposite is a miniature plush Tux figure. I’ve had to say to myself a few times ‘it’s just a coincidence’, ‘it’s just a coincidence’. I miss you guys too Ro Ro!